Baldwin is perfect as the voice of the Boss Baby. His deep vocal tones are authoritative and commanding, which make Boss Baby believable. Kudrow and Kimmel have a soothing quality to their voices that make them great choices for the parents. If you aren't the youngest child in your family and there is a least a few years difference between you and your younger sibling(s), then you know how Tim (Miles Bakshi; Shrek Forever After/Toby Maguire; Spider-Man) feels when his baby brother is born. Any older sibling will tell you that the new baby takes up all of the attention and steals the spotlight from them. Often, the older child feels angry and resentful of the "thing" that invaded their space. The Boss Baby explores this idea under the veil of a corporate espionage storyline. When Tim's new baby brother arrives, Tim gets jealous and feels neglected. 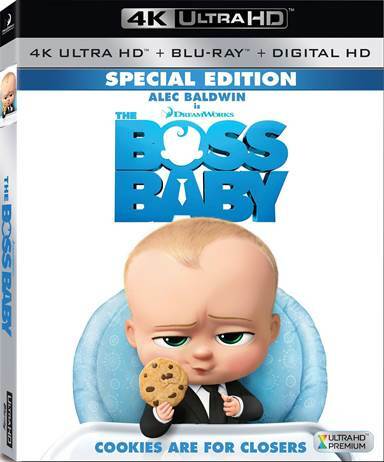 Then one day he hears something weird and upon investigating he finds out his "baby" brother (Alec Baldwin; 30 Rock) cannot only talk but is an employee of some huge company called Baby Corp. in an effort to discredit the boss baby, Tim goes on a mission to get "proof" for his parents. However, what Tom discovers is that Baby Boss is on a mission of his own –to find out what Puppyco (where Tim's [Lisa Kudrow; Friends and Jimmy Kimmel; The Man Show] parents work) is up to in order to stop them before they destroy the entire baby producing effort worldwide. Once Baby boss explains to Tim that if he can stop Puppyco then he will leave and Tim can have his parents back Tim is on board to help do whatever is necessary to get rid of Boss Baby. Of course, they save the day but in the end, this doesn't work out how either of them planned. Baldwin is perfect as the voice of the Boss Baby. His deep vocal tones are authoritative and commanding, which make Boss Baby believable. Kudrow and Kimmel have a soothing quality to their voices that make them great choices for the parents. Bakshi does well as Tim and Maguire's voice is calm and clear as he narrates some of the story. The 4K Blu-ray disc offers 2160p video quality with an H.265 HEVC Codec and an aspect ratio of 2.35:1. The picture is sharp and the colors a vibrant and true. The Dolby Atmos audio is clear with the dialog coming through the center channels and the sound effects dedicated to the surround speakers. It's fantastic how beautifully Hans Zimmer's (The Dark Knight) soundtrack comes through as well and is a testament to the Dolby Atmos' quality. The Blu-ray disc offers a number of special features including the Trailer and Gallery and deleted scenes. It also several cute segments including a Mini Adventure –The Boss Baby and Tim's Treasure Hunt: Through time, BabyCorp and you, The Forever Puppy infomercial, Babies vs Puppies- who do you love?, The Boss Baby's undercover team, Cookies are for Closers: Inside BabyCorp, and the great sibling competition. All the extras are cute and offer a little bit of entertainment. The movie doesn't shatter any ideas and much of the plot is recycled, with a twist, but it is cute and fun and has a couple of enjoyable songs on the soundtrack. The animation is well done and the underlying theme of sibling rivalry is some what adorable. It's a kid friendly film - as one would hope from an animated feature and the cast really brings the characters to life. While not earth shattering, the movie takes a look at what goes on inside the mind of a child when this new, helpless person enters their life. Download The Boss Baby from the iTunes Store in Digial HD. For more information about The Boss Baby visit the FlickDirect Movie Database.